To help class members understand the significance of temples and encourage them to seek the blessings of the temple in their own lives. Doctrine and Covenants 95; 109; 110. If the following materials are available, prepare to use them during the lesson: Pictures of the Kirtland Temple (62431; Gospel Art Picture Kit 500) and of another temple. Prepare to have class members sing “The Spirit of God” if you plan to use it during the lesson (Hymns, no. 2). Or ask a class member or a group of class members to prepare to sing it. How many temples were built by the Lord’s covenant people before this dispensation? How many temples were built or planned in the days of the Prophet Joseph Smith? Without asking for discussion of these questions, explain that we know of only four temples that were built by the Lord’s covenant people before this dispensation. The first was the temple built in the days of Solomon, which was rebuilt twice and known at different times as the temple of Zerubbabel and the temple of Herod (Bible Dictionary, “Temple,” 781). The other three are mentioned in the Book of Mormon: the temple built by Nephi (2 Nephi 5:16), the temple in the land of Zarahemla from which King Benjamin gave his final address (Mosiah 1:10; 2:1), and the temple in the land Bountiful where the people gathered before the appearance of the resurrected Lord (3 Nephi 11:1). Explain that five temples were built or planned during the life of the Prophet Joseph Smith: in Kirtland, Independence, Far West, Adam-ondi-Ahman, and Nauvoo. How many temples are currently built or under construction? Emphasize that the Prophet Joseph Smith was a temple builder. It was through him that Malachi’s prophecy of Elijah’s return was fulfilled (Malachi 4:5–6; D&C 110:13–16). The Church of Jesus Christ of Latter-day Saints continues to be a temple-building church. This lesson discusses the Kirtland Temple, the first temple built in this dispensation. This lesson contains more material than is possible to teach in one class period. Prayerfully select the material that will best meet class members’ needs. 1. 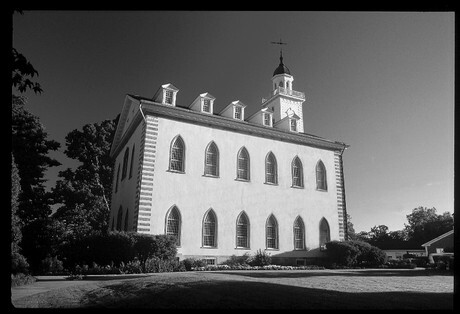 The Lord commanded the Saints to build the Kirtland Temple. Teach and discuss D&C 95. Explain that temples are an essential part of the gospel of Jesus Christ. In December 1832, the Lord commanded the Saints to build a temple in Kirtland, Ohio (D&C 88:119; 109:2; show the picture of the Kirtland Temple). Five months later the Saints had done little to fulfill this command, so the Lord called on them to repent and hasten their work (D&C 95). Four days later, men began hauling stone and digging trenches in preparation for building the temple. Some of the workers suggested they build the temple with logs or boards. But Joseph Smith replied: “Shall we … build a house for our God, of logs? No. … I have a plan of the house of the Lord, given by himself; and you will soon see by this, the difference between our calculations and his idea of things” (quoted in Lucy Mack Smith, History of Joseph Smith, ed. Preston Nibley , 230). You may want to point out that today the First Presidency, through revelation, determines when and where to build temples. 2. The Saints were blessed for their great sacrifices in building the temple. What sacrifices have you seen members of the Church make to receive temple blessings or to participate in temple work? What are some sacrifices we could make to participate in temple work? Kirtland Temple. This was the first temple built in this dispensation, dedicated in 1836. 3. Joseph Smith dedicated the Kirtland Temple. On 27 March 1836, the Prophet Joseph Smith dedicated the Kirtland Temple. The dedicatory prayer, which the Lord revealed, is recorded in D&C 109. The dedicatory service lasted seven hours and was accompanied by a great outpouring of the Spirit. It included the dedicatory prayer, hymn singing, testimony bearing, the passing of the sacrament, sermons, and a solemn assembly in which members sustained Joseph Smith and other Church leaders. The service ended with the Saints giving the Hosanna Shout—raising their hands above their heads and shouting three times, “Hosanna, hosanna, hosanna to God and the Lamb, amen, amen, and amen” (History of the Church, 2:427–28). You may want to have class members sing “The Spirit of God” (Hymns, no. 2), which was sung at the dedication of the Kirtland Temple. Or ask the assigned class member or group of class members to sing it. Why do we dedicate temples? How are temples different after they are dedicated? If any class members have attended a temple dedication, invite them to share some of their thoughts and impressions of the experience. D&C 109:7, 14. (We should seek diligently to learn by study and by faith.) Why is this an important responsibility with regard to temples? D&C 109:9, 17–19. (Our incomings, outgoings, and salutations should be in the name of the Lord.) How can we fulfill this responsibility? D&C 109:23. (We should leave the temple bearing the great tidings of the gospel to the ends of the earth.) How can temple attendance inspire us to do this? D&C 109:15. (The Lord’s people would receive a fulness of the Holy Ghost.) Invite class members to tell how temple attendance has increased the influence of the Spirit in their lives. D&C 109:22. (The Lord’s people would go forth from the temple armed with power and watched over by angels.) Invite class members to share experiences when they have felt armed with power after attending the temple. D&C 109:25–26. (No weapon or wickedness would prevail against the Lord’s people.) How does temple attendance protect us from evil? D&C 109:32–33. (The Lord would break off the yoke of affliction from His people.) How has temple attendance helped you overcome or bear affliction? D&C 109:36–37. (There would be an outpouring of the Spirit, as on the day of Pentecost; see Acts 2:1–4.) One fulfillment of this part of the prayer occurred during a priesthood meeting on the night of the dedication. The temple was filled with the sound of a mighty wind, and many brethren spoke in tongues, prophesied, and saw visions (History of the Church, 2:428). D&C 109:61–64, 67. (The scattered children of Israel would begin to be gathered and redeemed.) How does temple work help bring about this blessing? D&C 109:72–74. (The Lord’s Church would fill the whole earth.) How does temple work help bring about this blessing? President Howard W. Hunter, the 14th President of the Church, described these promises in the dedicatory prayer of the Kirtland Temple as “stirring and wonderful” (“The Great Symbol of Our Membership,” Ensign, Oct. 1994, 5). This prayer, he said, “continues to be answered upon us individually, upon us as families, and upon us as a people because of the priesthood power the Lord has given us to use in His holy temples” (Ensign, Oct. 1994, 4). 4. The Lord accepted the Kirtland Temple, and ancient prophets restored priesthood keys. Teach and discuss D&C 110. Explain that the Lord fulfilled His promise to endow His servants with power from on high when the Kirtland Temple was completed (D&C 95:8). This endowment of power included an appearance of the Savior in the temple, an outpouring of the Spirit, many revelations, and the restoration of priesthood keys by Moses, Elias, and Elijah. With these sacred experiences and keys, the Lord’s servants were able to move His work forward with greater power and authority. The authority to preach the gospel to gather Israel (missionary work). The blessings of the Abrahamic covenant and the responsibilities associated with that covenant (see Abraham 2:9–11 for a review of these blessings and responsibilities). The power that makes priesthood ordinances valid in heaven. The sealing power makes possible temple marriage, sealings to children and ancestors, eternal families, and temple ordinance work for the dead. 5. Temple building and temple work accelerate in our day. Along with the acceleration in temple building, Church leaders have given renewed emphasis to participating in temple work. Read D&C 138:53–56 with class members. Explain that worthy Church members today are among the “choice spirits who were reserved to come forth in the fulness of times to take part in … the building of the temples and the performance of ordinances therein.” How can we help accelerate temple work? President Howard W. Hunter said: “Let us be a temple-attending and a temple-loving people. Let us hasten to the temple as frequently as time and means and personal circumstances allow. Let us go not only for our kindred dead, but let us also go for the personal blessing of temple worship, for the sanctity and safety which is provided within those hallowed and consecrated walls. The temple is a place of beauty, it is a place of revelation, it is a place of peace. It is the house of the Lord. It is holy unto the Lord. It should be holy unto us” (Ensign, Oct. 1994, 5). Encourage class members to prayerfully examine their lives and determine how they can participate in temple work. Suggest that just as the Saints made sacrifices to build the Kirtland Temple, we should make sacrifices to assist with temple work. If you are near a temple, encourage class members to attend the temple. Testify that the Lord will bless us as we participate in this great work. You may want to use the following idea to supplement the suggested lesson outline. Suggest that class members display pictures of temples in their homes. President Howard W. Hunter said: “Keep a picture of a temple in your home that your children may see it. Teach them about the purposes of the house of the Lord. Have them plan from their earliest years to go there and to remain worthy of that blessing” (in Conference Report, Oct. 1994, 8; or Ensign, Nov. 1994, 8).